Spot the difference: the Dark Energy II looks similar to its predecessor, but it sounds different. 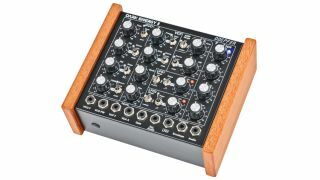 Since its release in 2010 Doepfer's Dark Energy has garnered a reputation as a suitably squelchy and surprisingly flexible old-school analogue synth. Now we have the second generation version. This has been launched out of necessity: with the original's CEM3394 ship no longer available, Doepfer has been forced to rework the synth and come up with a new kind of Dark Energy. There's now a sawtooth-based VCO core and a 12dB multimode filter (plus an all-new filter Mode control), while electronics buffs will be pleased to note that the mkII synth is more expandable. There are several other key differences, too. In fact, Doepfer is saying that this is, to all intents and purposes, a new synth. It offers USB/MIDI interfacing and CV connectivity and is available now for €428. Find out more on the Doepfer website.